This day is about the project specifications. They are the same as in the original Jobeet tutorial so you can see a more detailed description and a mockup design there. 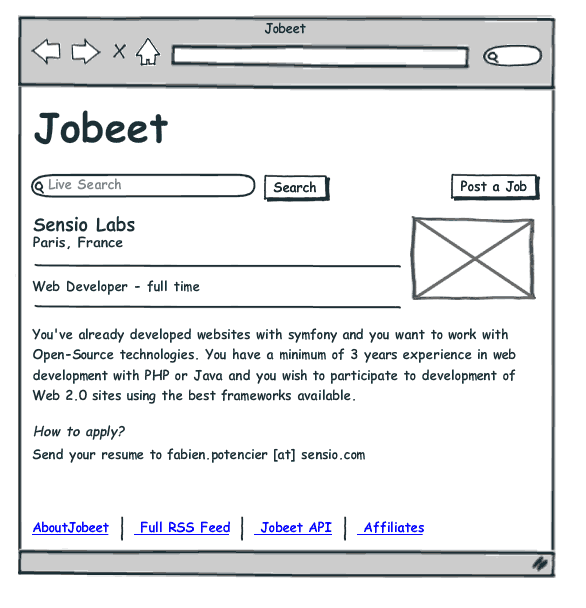 Jobeet is Open-Source job board software that only does one thing, but does it well. It is easy to use, customize, extend, and embed into your website. It supports multiple languages out of the box, and of course uses the latest Web 2.0 technologies to enhance user experience. It also provides feeds and an API to interact with it programmatically. We will have four type of users: admin (owns and administers the website), user (visits the site looking for a job), poster (visits the site to post jobs) and affiliate (re-publishes jobs on his website). In the original tutorial we had to make two applications, the frontend, where the users interact with the website, and the backend, where admins manage the website. Using Symfony 4 we would not do that anymore. We will have only one application and, in it, a separate secured section for admins. On the Jobeet homepage a user sees a list of 10 recent active jobs grouped by category. Only the location, the position, and the company are displayed for each job. For each category there are links that allow to list all the jobs. 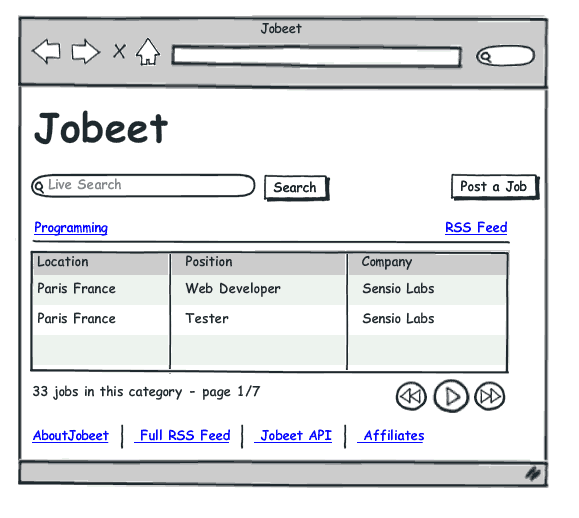 The user can also search for jobs or post a new job. The user sees a list of all the jobs from the category sorted by date and paginated with 20 jobs per page. 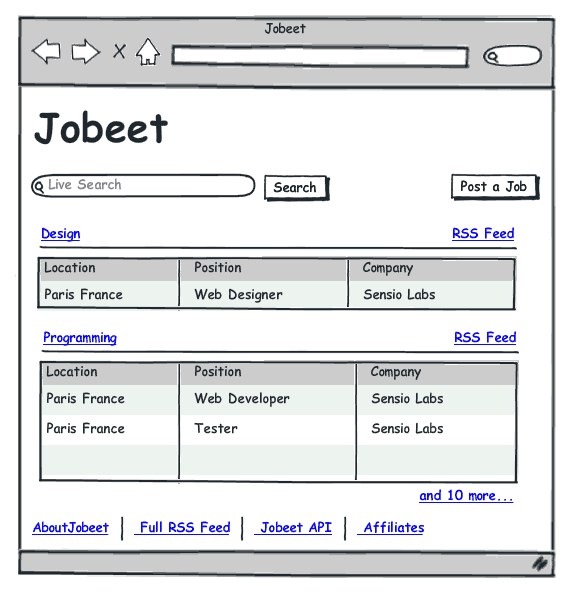 The user can select a job from the list to see more detailed information. The process has only two steps: first, the user fills in the form with all the needed information to describe the job, then he validates the information by previewing the final job page. There is no need to create an account to post a job. A job can be modified afterwards thanks to a specific URL (protected by a token given to the user when the job is created). Each job post is displayed for 30 days (this is configurable by the admin). A user can come back to re-activate or extend the validity of the job for an extra 30 days but only when the job expires in less than 5 days. The affiliate account must be activated by the admin. Once activated, the affiliate receives a token to use with the API via email. An affiliate will retrieve the current job list by calling the API with his affiliate token. The list can be returned in the XML, JSON or YAML format. 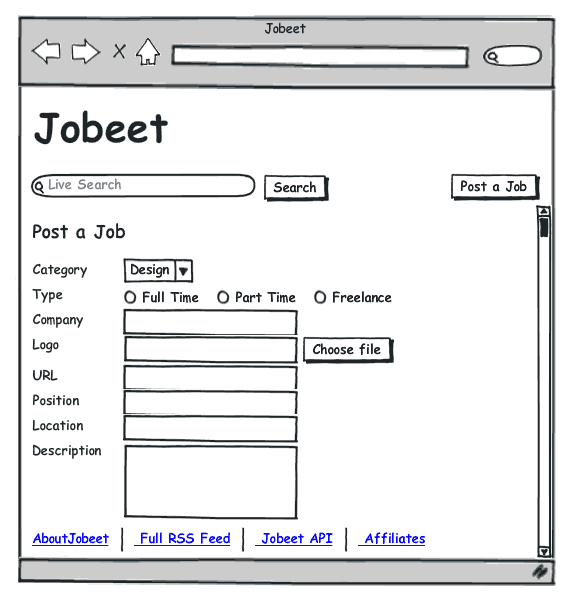 The affiliate can limit the number of jobs to be returned, and refine his query by specifying a category. An admin can edit the categories available on the site.